Aloe Vera has been used for centuries to care for and soothe the skin. 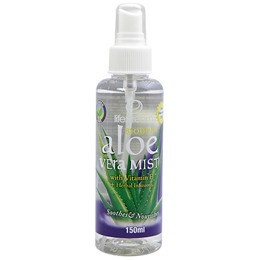 Lifestream Biogenic Aloe Vera Mist will soothe, rehydrate and refresh tired, dry, irritated and sun exposed skin. A wonderful blend of 95% pure Biogenic Aloe Vera Juice with added Vitamin E, witch hazel and herbal extracts of chamomile, balm mint and cucumber to stimulate and tone the skin while nurturing and protecting every cell. As a skin beautifier Lifestream Biogenic Aloe Vera Mist has natural moisturising and soothing properties. The pure inner gel of the Aloe barbadensis plant contains numerous essential minerals, enzymes, vitamins, proteins, amino acids, plus many other active components such as saponins and mucinous polysaccharides (MPS), essential for cell growth and renewal -such plants are known as Biogenic. BIOGENIC is defined as life generating or having the biochemical capacity to generate new life. Being Biogenic, the gel assists in the growth stimulation. Lifestream Biogenic Aloe Vera Juice, Polysorbate 20, Phenoxyethanol, Ethylhexylglycerin, Tocopheryl acatate (Vitamin E), Witch Hazel extract, Chamomile extract, Cucumber extract, Balm mint extract, Citric acid, Sodium hydroxide, Disodium EDTA, Potassium sorbate, Sodium benzoate. Spray liberally onto skin to soothe and cool as needed. Good after sun care. Use daily after your shower to nourish skin. Spray on your face regularly to refresh and hydrate or use as a toner after cleansing. Below are reviews of Lifestream Biogenic Aloe Vera Mist - 150ml Spray by bodykind customers. If you have tried this product we'd love to hear what you think so please leave a review. Lifestream Biogenic Aloe Vera Mist will soothe, rehydrate and refresh tired, dry, irritated and sun exposed skin. As a skin beautifier Lifestream Biogenic Aloe Vera Mist has natural moisturising and soothing properties.